When you’re getting your car ready to sell, you want it to look it’s best. You’ll need to clean it or have it cleaned professionally because the time/money you put into the car doing that is well worth it – you’ll get much more than that back with your selling price. One thing that you might consider doing is making the interior look brand new along with making your car’s headlights not look foggy. 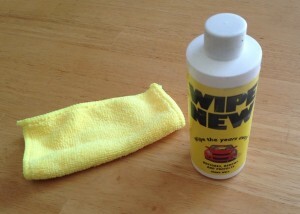 There’s one product on the market that claims to do a good job with these things and it’s called Wipe New. I’ve used it and here’s my review. This stuff is pretty powerful. They suggest wearing latex or rubber gloves and I suggest you do, too. You don’t want it on your hands because it’s difficult to get off. You’re going to throw away the gloves when you’re done, too. I’m no chemist, but I imagine Wipe New works a bit like acetone (nail polish remover) and might sort of slightly melt or dissolve plastic. Again, I’m no chemist and I do not suggest using acetone instead. They give you some small sponges to use. On the second use, I just cut a cheap household sponge in two and that worked well. Use just a bit at a time. You need to get the sponge wet but don’t soak it. As you work it on plastic, you’ll know if you are using enough or not. You’ll want to do it on a nice day (not too hot, not too cool out) and in a well ventilated area (there’s a smell but it’s not horrible). You can use it on your dashboard and really anything that’s plastic. Don’t get it on your car’s paint – so go slow around those areas. On the exterior of your car, you can use it really on anything that’s plastic. Places like door trip are good and the black plastic area where the windshield wipers are is another good place. Also think about areas around the door mirrors, too. Years ago now, car manufacturers came up with these plastic headlights. They’re nice because you just replace the bulb instead of the whole headlight assembly (I remember changing the whole headlamp on my mom’s Cavalier back in the 80s). Those old headlights, though, were made of glass so they didn’t fog up. The newer, plastic ones that you see out there appear to fog up but that’s just really wind and dust and sand and rocks hitting them and marking them up. They appear to look fogged out but in reality, they’re just worn. A few years back, before Wipe New came out, I tried these headlight restoration kits and got limited results. 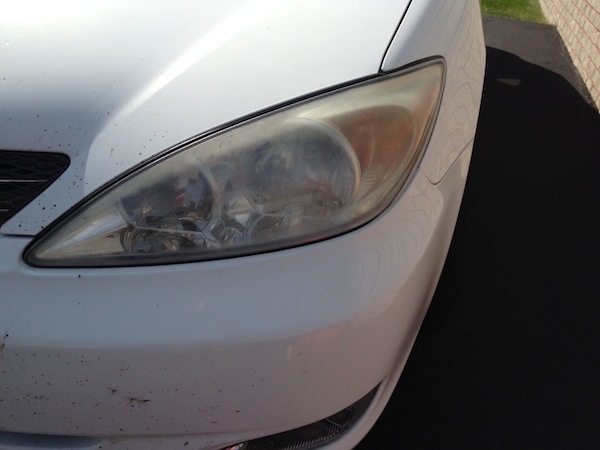 I also had my headlights de-fogged at the local, full service car wash a few times and that lasted maybe 6 months and I’d have to get it done again. With that system, they using a solution and some sand paper and then finishing it off with some wax and a buffer. With Wipe New, you avoid all that and the results are better. Just take some Wipe New and carefully apply it to your plastic headlights. Again, be careful around the corners so that you don’t get any on your car’s paint. Use a good amount of it. Once you’re done, you’ll just let it dry for several hours. Don’t try to wipe it dry or wax it or anything – just let it sit… then you’re done and the results are pretty amazing. I got my BMW recently and it’s a 2009, so the headlights look pretty good still but my friend, Heather, was asking me if I’d help her with cleaning her car’s headlights. She wanted to borrow a drill with a cord since that’s what the directions on her headlight restoration kit called for. I looked and I still had enough Wipe New left over, so I headed over to her place with the drill and the Wipe New and some sponges. She had some gloves, so we each did a headlight and the results were great. She wanted this done because her lights were getting so foggy that her lights seemed dim at night. Doing this definitely brightened things up. I’d give Wipe New a 4.5 out of 5 stars for sure. It’s easy to use, does the job and works really well without a lot of effort. The only downside is the smell and that you have to let it dry a while but that’s a small price to pay for the results you get. If you’re looking to clear up your foggy headlights, then the $20 (or so) investment into Wipe New is a no brainer. 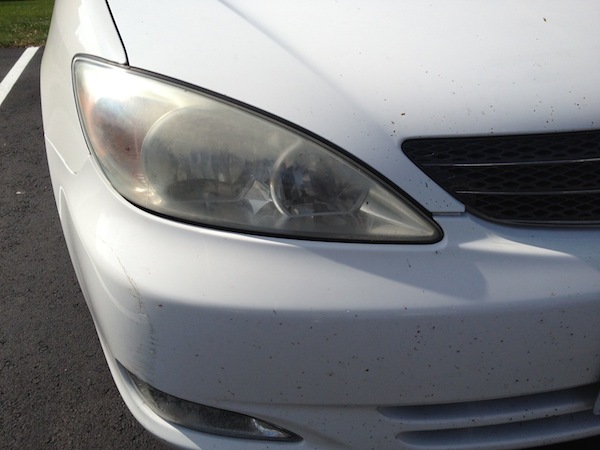 Local car washes and car detailers will charge $40 or more for clearing up your car’s headlights and it doesn’t last as long or look as good as Wipe New. This is the type of product to use on your car once a year for sure – if you plan to sell it or not. If you are planning on selling your car, then again, it’s a no brainer. The $20 investment will pay off big time. Just make sure you do it a few days before you plan to sell the car and give the car time to air out so that the chemical smell isn’t there as you’re trying to show your car to a potential buyer. They might wonder what that is. I hope you found this review article beneficial. 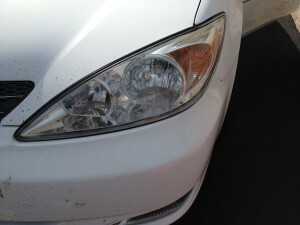 I used Wipe New on my Acura and then now on Heather’s Camry with great results. I used the product myself and I believe I objectively wrote up this review because there have been plenty of products I’ve tried that haven’t worked out well. If you liked this article, then please bookmark it and share it with others. If you have comments on using Wipe New or your own review of this product, then please leave your comments below. 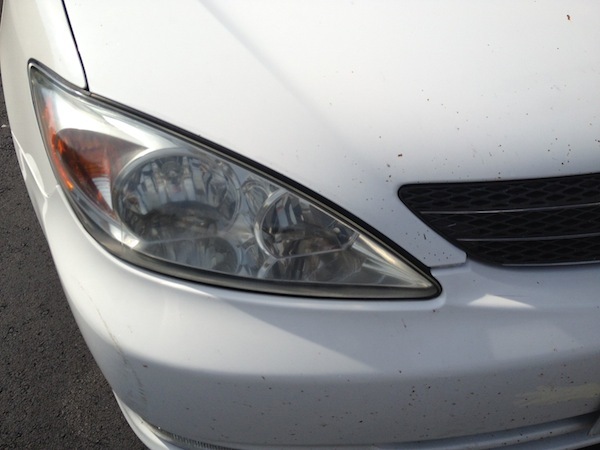 This entry was posted in Car Exterior Tips and tagged car detailing, car detailing steps, car detailing tips, car detailing tips and tricks, headlight restoration, headlight restoration kit review, headlight restoration kits, wipe new, wipe new review by TC. Bookmark the permalink.